Ten unpatented placer claims equaling approximately 1600 acres, including 1/2 miles of the Tusas River. Extensive research dating back to the 1950’s reveals the extraordinary potential for Col-Tan Rare Earth Placers. 10 miles west of Taos New Mexico, USA. Access via paved state roads to the village of Petaca NM. Well maintained forest roads 2-3 miles to property. Recent analysis has indicates a significant finding of HREE enrichment. 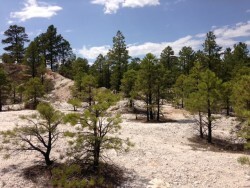 The New Mexico Geological Survey has indicated more than 2000 feet of weathering which has resulted in the potential formation of placer deposits that contain millions of pounds of valuable rare-earth elements. Analysis of data, by the University of New Mexico, reveals a concentration of valuable REE’s, including Dysprosium, Neodynium, and Yttrium, along with Niobium and Tantalum. Assessment work for 2014 is underway and the Small Miner’s Exemption will be filed by September 1, 2014 for the year 2015. Jahns' 1946 paper " Mica resources of the Petaca District" gives a full description of the property. Basically this area is a large block of Pre-Cambrian granite hosting numerous pegmatites. The pegmatites contain an abundance of minerals enriched in niobium, tantalum, and rare earths. In 1999 I was involved in a project to develop this area for its outstanding potential as a placer mining project, as a financial backer. All studies performed by our geologist reinforced the 1954 ASARCO findings. The geologist prepared a report summarizing twenty year's of research into this area, I now have this report and it is available nowhere else. After all due diligence was preformed the project was bought by a Canadian mining company. Unfortunately, 911 occurred and the project fell apart due to numerous concerns of the buyers. 12 month lease or lease-purchase fee $50,000.00 in cash. All buyers must be pre-qualified and a non-disclosure agreement in place.